From the author of the heartwarming novel, The Charm Bracelet comes a new novel filled with as much warmth and charm as its predecessor. The Hope Chest by Viola Shipman is a beautifully written story of never-ending love, hope, and beautiful memories. Mattie grew up with loving parents at a cozy beach house. As she grew older, the beach house became hers and her husband’s Don’s home. Filled with memories, Mattie is saddened in her old age to leave it behind. But she is struggling with ALS, and can no longer care for herself. Her husband is a loving and tireless caretaker, but he can’t do it alone, so they hire a woman, Rose, who has a young daughter, Jeri, to help care for Mattie. As time goes on, the older woman grows to care for Rose and her daughter. One day the young girl opens the old hope chest and suddenly the memories of Mattie’s childhood come alive. Mattie has a charming story to tell for each item in the chest, and the reader is shown her world, one item at a time. 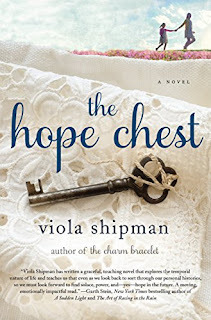 A lovely story woven between the past and present, The Hope Chest is sure to pull at your heartstrings. I highly recommend it to anyone who loves a story of family, love, and hope.